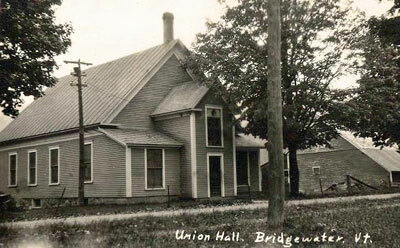 The Union Hall on the upper end of the village was the entertainment center for the town. In the early days there was an old movie projector up stairs and movies were shown there. Gramp stored it in his barn for years. The last time I saw it, was in a hallway at the Mill. I hope somebody saved it. It was a part of Bridgewater history! 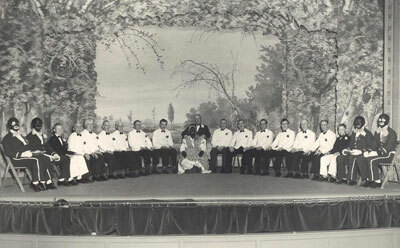 The annual minstrel show involved just about everyone in some capacity. It was a fun time and everyone loved it although it became no longer politically correct. I used to go to the country & western shows there. We had performances by Doc Williams and once Hawkshaw Hawkins, the Nashville star that was later killed in the same airplane crash with Patsy Cline. I often think about them when I’m at the Grand Old Opry in Nashville! The other fun thing was roller skating there. Somebody would come through with these screw-on roller skates, music sound system and colored lights. My cousin Babe was the best skater in Bridgewater when he came back from the Marines in California. With those old skates I used to get blisters on my feet as big as quarters but not to be undaunted, we skated on!